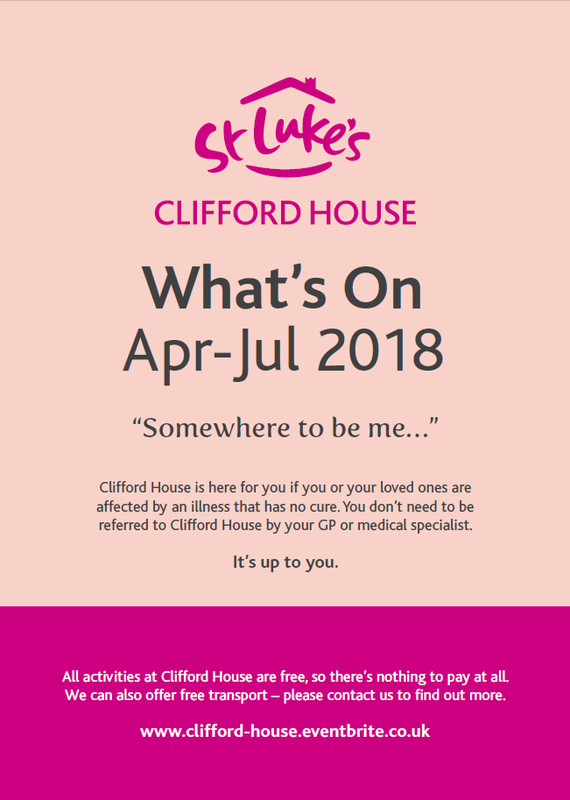 Our What's On guide for April-July 2018 is now available. You can download a copy by clicking on the image below. Print it out, stick it on your fridge, or keep it in your diary! Meaning 'chit chat' in Urdu, Naureen's Gupshup Club is open to everyone, but is particularly aimed at speakers of Urdu, Punjabi and Bengali. It's a chance to take part in our Clifford House activities and get to know people in similar situations if English is not your first language. Speak to an expert from hlw Keeble Hawson about legal matters in a half-hour appointment slot. Learn techniques to paint or draw beautiful landscapes in our popular art class. Due to popular demand we've set up a fun general knowledge quiz in the kitchen. No need to book - just drop in! A safe space for you to find answers to the questions you've never felt able to ask. Here you can speak to St Luke's staff and each other in open and sensitive conversations regarding your wishes for end of life care. The easiest way to book any activity is online through the button below.